By Benito Pérez Galdós, London: Everyman, 1996. Written by Benito Pérez Galdós, one of Spain's best kept literary secrets and arguably the greatest Spanish author since Cervantes, That Bringas Woman (1884) is part of Galdós' panoramic series of novels about Madrid social life and is also indirectly, a novel about the revolution in Spain. Focusing upon the Bringas household in a manner reminiscent of, and probably influenced by, Zola, it offers a shrewd and none too flattering analysis of feminine psychology, and an intimate portrait of marriage. However, unlike Flaubert, Tolstoy and Alas, the other great novelists of adultery of his day, Galdós' view of the subject and its consequences is both hard-headed and humorous rather than tragic. 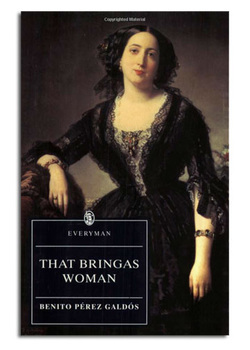 Click here to purchase That Bringas Woman.